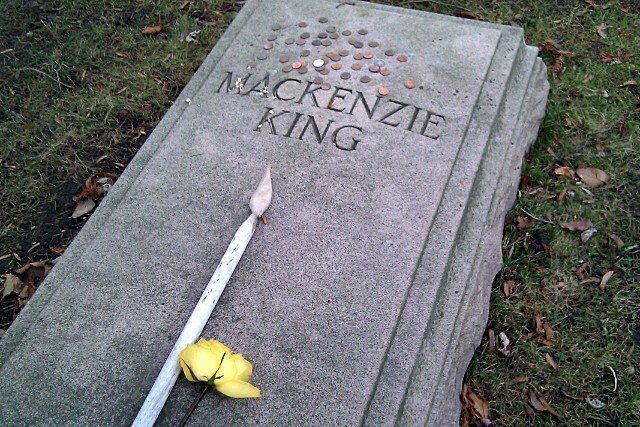 I wrote about the comings and goings of money on Mackenzie King’s grave last month. 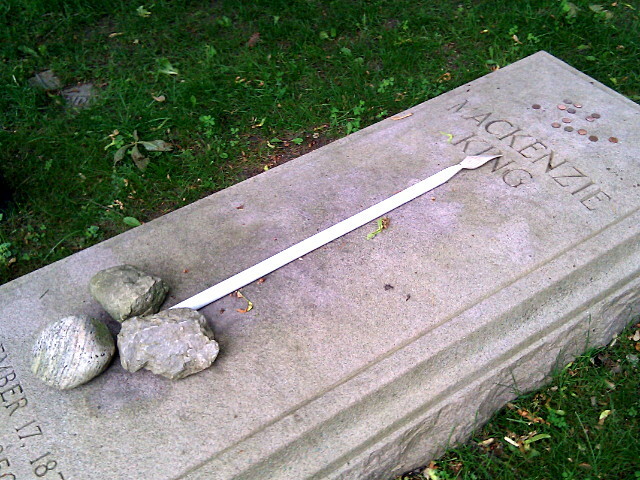 When the cash disappeared again in October, I figured that the mystery of the pennies was over: in the five months that I’d been keeping an eye on the waxing and waning of Mackenzie King’s fortune, the empty ledger stone stayed that way unless I anted up a few cents to get the penny collection started again. And since I’m no longer a daily passer-by, my ability to assist and document the phenomenon has suffered. But I was alerted last week that something may be up when someone arrived at Dodgeville after Googling “why pennies on mackenzie king’s grave.” Sure enough, when I rode by this week, Mackenzie King’s ledger was as overflowing with money as it ever has been. 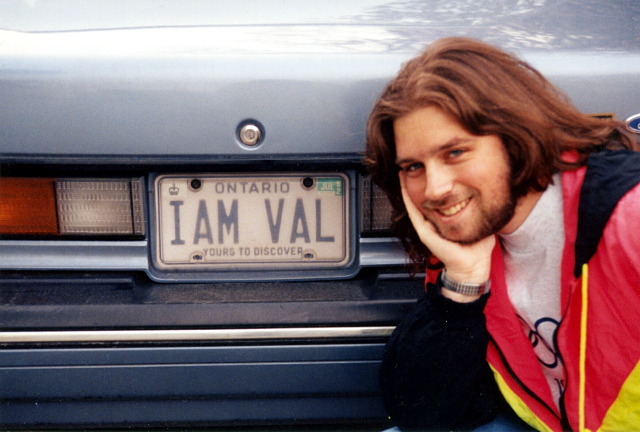 Apparently, someone’s been seeding the account in my absence. It also made me wonder about what started this cash bonanza in the first place. As I’d written in my previous post, I have no idea who placed the original eight pennies in June that started Mackenzie King’s cash collection this year. At least one person noted a single penny on the ledger as early as August 2009, but that certainly didn’t blossom into the same kind of ongoing investment that I’ve seen this year. Placing money on Mackenzie King’s grave may be an old tradition, but it’s one that’s been taken up by many more people this year than in the past. 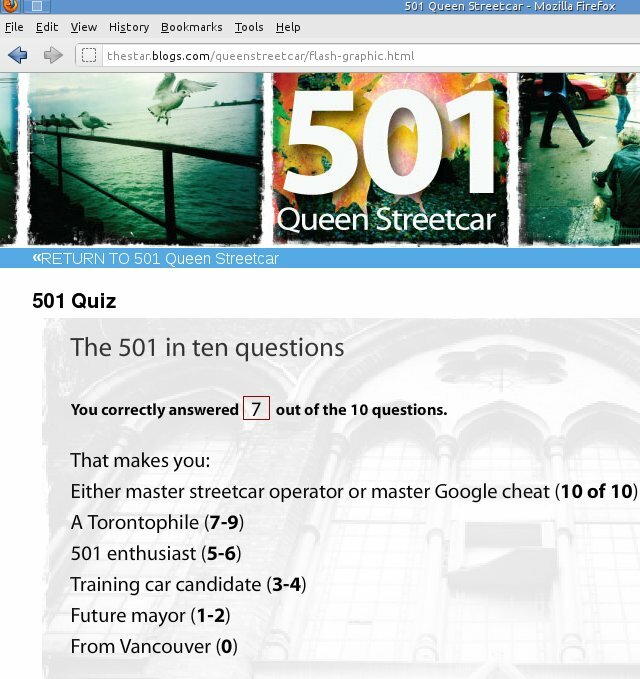 I guess that having actually ridden the 501 means that I’m just not mayoral material. I’d agree with that sentiment judging by the current administration at City Hall, but I sincerely hope that we’ll have learned our lesson by the next election. One of the fun things about doing research is occasionally stumbling upon something wholly unexpected and completely unrelated to your original task. Such was the case the other day when I realized that I could read all of those electronic highway signs without having to get into a car and drive on any of the local highways. 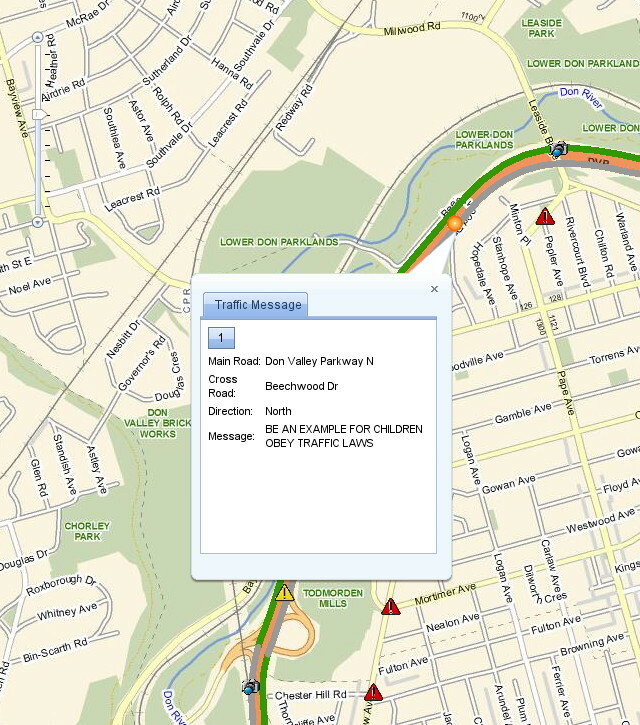 On the city’s road restrictions map, you too can click on any of the amber circles dotting the city’s highways to read the message that’s currently displayed on that particular sign. 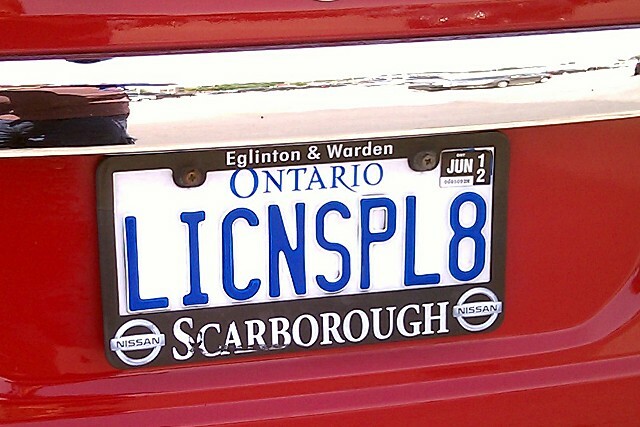 You never need to miss another “obey traffic laws” or “drive according to road and weather conditions” again. …I would have taken a picture of Rob Ford campaigning at the East York Canada Day Parade last year, where he was glad-handing the crowd instead of kicking back at the family cottage where he says he’s spent Canada Day for the last 30 years. Granted, he could have gone up to the cottage after the parade, but his claim that July 1 is some sort of inviolable family cottage getaway is pretty tenuous. There’s a whole class of personalized plates that I’ve never really understood: the ones that reference the car itself. MY BMW, JIMS JAG, and so on. 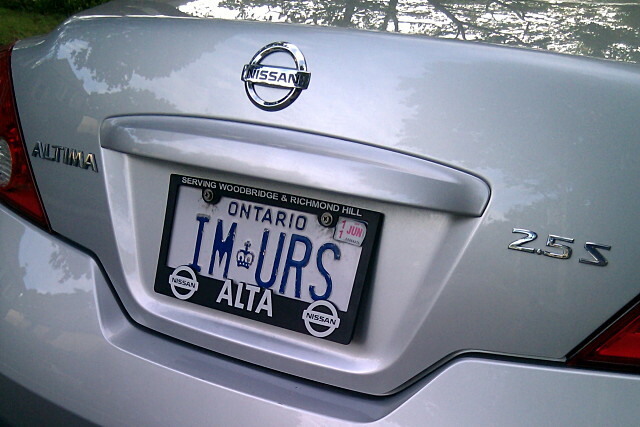 I mean, I can tell by looking at the car that it’s a BMW or whatever and I’m really not sure why someone needs to use a licence plate as an additional nameplate. One they pay extra for, no less. This one takes needless self-reference and turns it up to 11. I love it.